The Blackwell Handbook of Language Development provides a comprehensive treatment of the major topics and current concerns in the field; exploring the progress of 21st century research, its precursors, and promising research topics for the future. Considers the past work, present research, and promising topics for the future. Marilyn Shatz is Professor of Psychology and Linguistics at the University of Michigan. She is author of A Toddler’s Life (1994). 1. 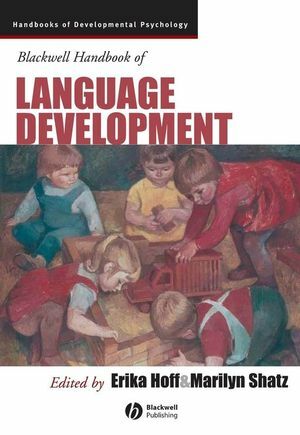 On the Development of the Field of Language Development: Marilyn Shatz (University of Michigan, Ann Arbor). Part I: Basic Foundations and Theoretical Approaches to Language Development:. 2. The Neurodevelopmental Bases of Language: Valerie L. Shafer (City University of New York) and Karen Garrido-Nag (City University of New York). 3. Formal and Computational Constraints on Language Development: Helen Goodluck (University of York). 4. Domain-General Learning Capacities: Jenny R. Saffran (University of Wisconsin-Madison) and Erik D. Thiessen (Carnegie Mellon University). 5. How Inherently Social is Language? : Dare Baldwin (University of Oregon, Eugene) and Meredith Meyer (University of Oregon, Eugene). 6. Input and the Acquisition of Language: Three Questions: Virginia C. Mueller Gathercole (University of Wales, Bangor) and Erika Hoff (Florida Atlantic University). 7. The Emergence of Language: A Dynamical Systems Account: Julia L. Evans (San Diego State University). Part II: Language Development in Infancy:. 8. Experiential Influences on Speech Perception and Speech Production in Infancy: Linda Polka (McGill University, Montreal), Susan Rvachew (McGill University, Montreal), and Karen Mattock (McGill University, Montreal). 9. Acquiring Linguistic Structure: LouAnn Gerken (University of Arizona, Tucson). 10. Cognitive Processes in Early Word Learning: Diane Poulin-Dubois (Concordia University, Montreal) and Susan A. Graham (University of Calgary). 11. Syntactic Supports for Word Learning: Letitia R. Naigles (University of Connecticut, Storrs) and Lauren D. Swensen (University of Connecticut, Storrs). Part III: Language Development in Early Childhood:. 12. Phonological Development: Carol Stoel-Gammon (University of Washington, Seattle) and Anna Vogel Sosa (University of Washington, Seattle). 13. Mechanisms of Word Learning: Gil Diesendruck (Bar-Ilan University, Ramat-Gan, Israel). 14. The Abstract Nature of Syntactic Representations: Consequences for a Theory of Learning: Jeffrey Lidz (University of Maryland, College Park). 15. Conversational Understanding in Young Children: Michael Siegal (University of Trieste/University of Sheffield) and Luca Surian (University of Trieste). 16. Bilingual First Language Acquisition: Fred Genesee (McGill University, Montreal) and Elena Nicoladis (University of Alberta, Edmonton). Part IV: Language Development after Early Childhood:. 17. Developing Linguistic Knowledge and Language Use Across Adolescence: Ruth A. Berman (Tel Aviv University). 18. Language and Literacy in Bilingual Children in the Early School Years: D. Kimbrough Oller (University of Memphis) and Linda Jarmulowicz (University of Memphis). 19. Second Language Acquisition in Childhood: Johanne Paradis (University of Alberta, Edmonton). Part V: Atypical Language Development:. 20. Children with Specific Language Impairment: Bridging the Genetic and Developmental Perspectives: Mabel L. Rice (University of Kansas, Lawrence). 21. Atypical Language Development: Autism and Other Neurodevelopmental Disorders: Helen Tager-Flusberg (Boston University). 22. Reading and Reading Disorders: Heikki Lyytinen (University of Jyväskylä, Finland), Jane Erskine (Niilo Mäki Institute, Jyväskylä, Finland), Mikko Aro (Niilo Mäki Institute, Jyväskylä, Finland), and Ulla Richardson (University of Jyväskylä, Finland).